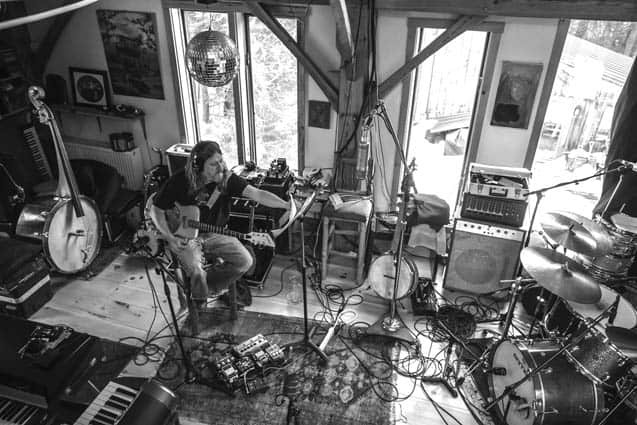 If you live in the Killington region, you have probably heard of the awesome musician I interviewed this week. If you’re not, get to know him here. Either way, you should head to the Pickle Barrel this Thursday night, Feb. 9 and see Bow Thayer rock out with his modern mountain music band. It’s influenced by bluegrass and Americana. It’s mirky roots music but with a modern twist. They’re playing different tunings and singing about socially conscious stuff, not just going to the whiskey still with your sweetheart. There will be lots of improvisation. Thayer likes that he can go in a whole new direction now. He was running out of ideas before this and so were others in the Americana scene. Thayer grew up south of Boston in Hingham, Mass. where he went to high school, then went to college in Syracuse, N.Y., and then back to Boston to attend art school. After that he hit the road with a punk rock-type band called Seven League Boots. “It was more alternative rock than punk. This was back in the 90s. We toured all over the place, like ghetto-style touring.” They toured with Fugazi, Mighty Mighty Bosstones, Bad Brains, and more. They went all over the country and to Canada. The band eventually broke up and Thayer moved to Vermont and has been here about 20 years. He always came up here to go skiing so he knew the area well. He bought a tiny camp in Gaysville and built a house and a studio there. He cut down a bunch of trees, timber framed it himself and used all salvaged parts. Thayer picked up the guitar when he was 12. “I was a kid that was listening to everything: Neil Young, the Dead, the Stones, the Beatles, all the obvious classic rock stuff. I just gravitated right to the guitar. My grandmother bought me my first guitar that I still have. From there I started a band almost instantly. I’ve been playing gigs pretty regularly since I was about 15 years old. When I was about 30, I picked up the banjo. I was getting more into the bluegrass thing.” It was then that Thayer started a bluegrass band called The Benders. Thayer said his songwriting went hand-in-hand with learning the guitar but he never really went far with it. “I have some early four-track recordings in the 80s. When I got with Seven League Boots, I was just the guitar player and I was writing with a group so I was just concentrating on guitar parts and not focusing on words and lyrics.” After that group broke up in Reno, Nev., Thayer went to hang with friends in Flagstaff, Ariz. His buddy had a 16-track studio and he started writing like crazy. That’s when he turned down the guitar and started doing more acoustic. Thayer moved back to Boston and formed a trio called Still Home. That was during the big grunge scene and they were touring with Iggy Pop. One of their first gigs was playing with Pearl Jam back before their big record “Ten” came out. They played this song “Red Hot Mama” and Eddie Vedder came out and played it with them. Thayer remembered, “We didn’t even know who they were, nobody knew who they were.” They thought Still Home was going to go somewhere but it eventually fizzled out when their bass player flaked out. After that, Thayer got into the slide stuff. He started a band that was very similar to how the Black Keys are now. It was a duo with Thayer on guitar and a drummer. That’s when his band Elbow started. “We were mostly based out of New York City because that’s where the drummer lived. I was living in Boston but would go to N.Y. every weekend.” His uncle owned some land in Killington and Mike (the drummer) and Thayer opened up Toad Stool Harry’s on Route 4 down by the Pasta Pot. That was a legendary after-hours club. Back in the good old K-town days, you could go there and hang out till 5 a.m. listening to great music. Old schoolers will know what I’m talking about. It was a treasure that could never happen today. Bow Thayer sits in his studio surrounded by instruments of all types, including drums, mics, keyboards and many amps.